Dublin Horse Show Family Day - Premium Grandstand seats on Sunday 24th July for 2 adults and 2 children. With the Rewarding Times Offer to the Dublin Horse Show you will enjoy PREMIUM SEATS in the GRANDSTAND on Family Day Sunday 24th July for just €55.00 (worth €107.00) for 2 adults and 2 children. This year there is more family entertainment than ever before. You and the family will be wowed by the amazing theatrics from some of the best street performers in Ireland, specially sourced for the Show. You will get to see Olympic athletes just weeks before they compete in Rio. 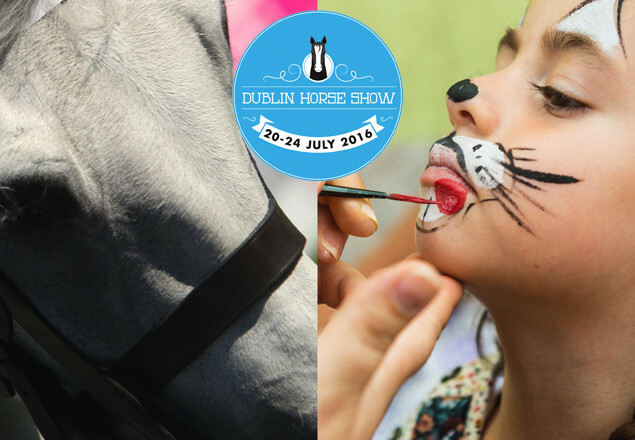 And with the ever-popular pony rides, face painting and interactive story-telling, the Dublin Horse Show is sure to create cherished summer memories for everyone, whatever their age. Vouchers are valid for the Dublin Horse Show on Sunday 24th July 206. This should be presented at the TICKETMASTER Box Office outside the Concert Hall entrance to the RDS on Merrion Road from Tuesday 19th July and your Horse Show Tickets will be redeemed against it.